Zoë was interviewed briefly about her performance in Othello as part of a programme produced to help pupils studying AS-level English with their exam revision. Narrator: In Othello, Emilia is both the wife of Iago who has no idea how evil he is and Desdemona's faithful maid who helps to bring about Othello's destruction. What makes this character tick, and how believable is she to a modern audience? 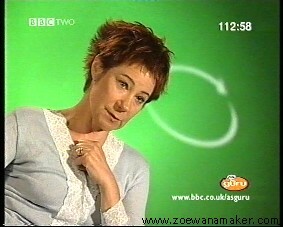 N: In the next interview Zoë Wanamaker, who played Emilia in that production, describes how she approached the role. Zoe: The approach I took to play Emilia in Trevor Nunn's production was one of an abused woman, so I read a lot of books on women who had been married to murderers [and] who had not wanted to believe that their husbands were murderers. She has a small speech where she says that men eat women up and then spit them out when they've finished with them [i.e. Act III, scene iv: men 'are all but stomachs, and we are all but food. / They eat us hungrily, and when they are full, / They belch us']. N: So, although Emilia is imagined as living in sixteenth-century Venice, the actress was able to draw on contemporary ideas such as psychological abuse and perhaps her own knowledge of how sexual relationships can go wrong.